It seems that another industry may have influenced Microsoft in it's approach of Deployment Options with Dynamics 365 for Operations. The software can be deployed, in the Cloud, as a hybrid between being in the cloud and on-premise, and finally storing your data locally (aka) on-premise. Finally, you can have it (the software) your way. And if your company decides to change flavors of deployment, the process is easy if customers are active on their Microsoft Dynamics Enhancement Plan or Software Assurance program. One single implementation approach in Life-Cycle Services (LCS) allows for multiple deployment approaches – fully cloud; Cloud connected on-premise, or hybrid deployment, and storing your local data on-premise. For these scenarios, Microsoft provides an on-premise server, designed to operate with the simplicity of an appliance that cache's data locally and accelerates operations when the service is connected. The server provides for offline capture of transactions, then recovers offline transactions through the server and reconciles the two data points upon reconnection, and finally provides for the connection of local hardware peripherals. This combination of cloud storage operating together with local hardware appliances provides an excellent alliance of capabilities and functions. Since the hybrid cloud allows the best of both worlds like Power BI and Cortana, Clients First, believes this option to be the best for manufacturers and retail operations who need advanced business intelligence, but can not be hindered by internet connectivity issues. Sri Srinivasan on the week of 2/20/2017 announced that Dynamics 365 for Operations will allow local business data to stay on-premise with general availability in June 2017. 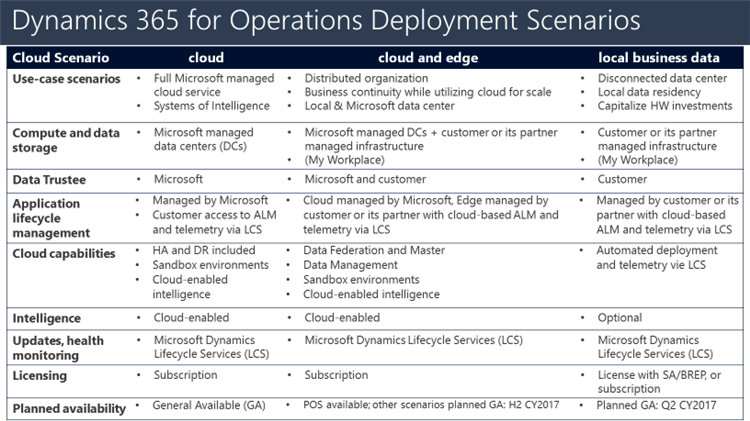 Since Dynamics 365 for Operations is available in the cloud, the on-premise deployment option is referenced by Microsoft as, “local business data.” Local business data will run your business processes on-premises, supporting local transactions and storage of business data, without replication of business data to the cloud. In these cases, the typical replication of business data in the cloud is simply switched off. For the “local business data” deployment scenario, the application servers and SQL database will run in a customer’s (or your Value Added Reseller's (VAR’s) data center. Customers and partners will manage the application lifecycle through Life Cycle Services (LCS) in the Microsoft Cloud, including designing the business processes, creating and deploying the software image to deploy onto the on-premises nodes, monitoring the on-premises nodes in a system health dashboard, and keeping up with innovation from Microsoft. If your business needs change, and your company wants to utilize Dynamics 365 for Operations cloud capabilities such as Microsoft's intelligence capabilities of embedded Power BI, machine learning, or IoT customers can choose to take advantage of the embedded intelligence functions by simply turning ON data synchronization to the cloud. Please note: The on-premise data will not benefit from Microsoft's intelligent cloud capabilities like Power BI, AI, or other capabilities available to cloud subscribers. Since Local Data offers ultimate security of in-house data, we suggest that this solution be deployed at Maintenance Repair and Overhaul Organizations (MRO's) who need to have secure data for FAA regulations, and for process manufacturers who need to keep their formulations under lock and key. For once Microsoft is being a gentle giant, and learning from fast food operators in that your business can have your software deployed, your way. Another benefit to these deployment options over mid-market competitors is the flexibility to change your deployment option through Life-Cycle Services. To read more about the flexibility in the deployment options, read our blog, "Dynamics 365 for Operations to Be Available On-Premise." Clients First is a Microsoft Gold ERP and CSP Partner which is required for us to sell this solution. 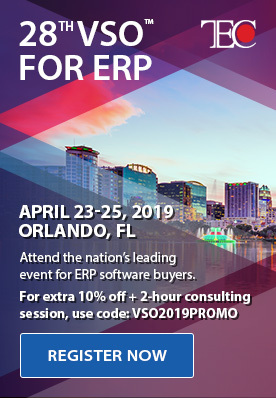 We have been leveraging the power of Microsoft Dynamics AX since the pre-cloud days when Dynamics 365 for Operations was called Axapta in 1999. Clients First and Dynamics 365 for Operations can help make your business more productive with the power of ERP. 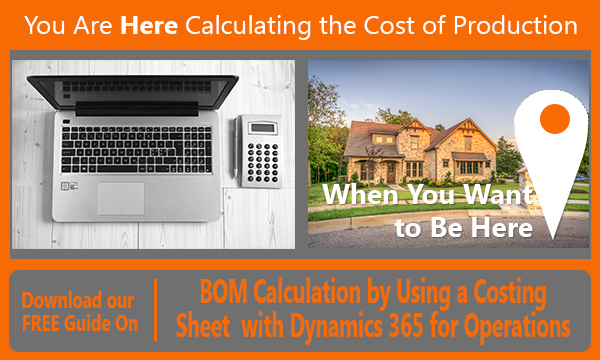 Call us to get a demo that demonstrates how this solution can solve your biggest business challenges. Email: Dallas/Fort Worth, Texas, or call at 800.331.8382.